College living and college life can be very expensive, as you know. Still, when a friend burrows a pen and doesn't return it, it's a loss you can afford. But what about losing your iPad or breaking it? That's a loss anyone would regret. Your iPad or tablet device is easily one of your most valuable items for college, so take good care of it. If you keep your tablet in its own specialized bag like this Pink/Green Floral iPad Bag, you'll be in the habit of keeping it properly stored. At some point everyone's left something valuable, be it a dorm item or a wallet, forgotten on a table somewhere. Instead of just carrying your tablet around and setting it down, keep it in this cheap tablet bag to help you remember to take it with you. 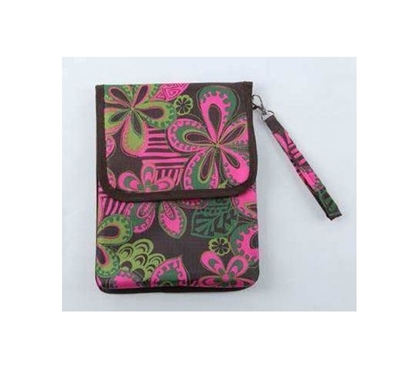 The multi-colored floral decor of this cheap iPad bag also means you'll carry that iPad around in style. Since iPads and other tablets have decorative cases, why not make your iPad carrier bag look just as nice? Aside from looking good, this college bag will keep that iPad snug and protected. If you carry your tablet by hand and someone bumps into you, your device is the last think you want dropped. This bag can also be placed in a backpack for college or a college messenger bag for even more protection and ease of transportation.